Ready, set, go! When your labor begins, you’ll likely feel excited as well as nervous through the contractions. The last thing you’ll want to do is worry about putting what you need in a bag. It’s a good idea to pack early and have everything ready to go at the beginning of your final month. Before you start packing however, take the time to call the hospital or review their website to find their policies on allowable items. For example, while some hospitals may allow candles or iPod docs, others may not. Knowing ahead of time what you’re allowed to bring in the hospital bag for delivery with you will save you hassle and disappointment later. Ready to pack that bag? Here’s what should go in it. Paperwork When checking into the hospital, they’ll need to see a photo ID such as a driver’s license or passport as well as your insurance card. If you have a medical condition, it may be a good idea to have copies of anything relevant to labor and delivery. Your Birth Plan Plan on bringing several copies. This document can clearly communicate your wishes regarding your labor and delivery in a concise manner. In other words, you won’t need to grunt it out between contractions or continually repeat it to new doctors or nurses when the shift changes. Bring tape as well—post it on the outside of your door so hospital staff can read it and avoid offering your pain medication if you don’t want it. Camera Whether you plan on recording the birth, or just text messaging your little one’s arrival, make sure you pack your memory-maker in your hospital bag for delivery. Also pack extra batteries (if required) and any chargers. It’s likely in the first hour of your son or daughter’s life you’ll take 500 pictures, so a full charge is essential. Comfy Clothes There’s nothing comfortable about being in labor, but wearing your own clothes, and taking clothes to wear afterwards can mean all the difference. The hospital should provide you with a gown, but it will be thin and open in the back; you may want to bring your own. Hospitals tend to run cooler than warmer, so bring socks and a bathrobe too. Comfy PJs are a good idea as well. Slippers are a good idea too; they’ll provide warmth as well as protection from slipping. Don’t forget a going-home outfit for you and the baby! Whether you give birth naturally or by C-section, you will be sore for several days, so pack clothes that are not only easy to get on, but that are loose. Items to Help you Relax iPads, DVDs, podcasts, a digital picture frame, a memento from a special trip, a scented candle, iPod doc…any or all of these items can help you focus as well as relax during labor. If you experience a long labor, you’ll be glad to have something to focus on other than what’s provided in the hospital room. Remember to bring all the chargers! Toiletries Hospitals aren’t Starwood Resorts, so pack what you like to use. 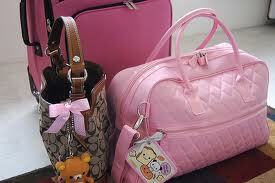 If you’re packing your bag early, buy extra toothbrushes, toothpaste, deodorant, a brush, and shower stuff. Consider packing scent-free items in your hospital bag for delivery; many baby’s noses and skin are sensitive to the scents and lotions/shampoos you use. It’s a good idea to pack extra lip balm as well. Don’t forget some simple make-up; not because you need it, but sometimes a simple powder or mascara just makes you feel better. Stuff for Your Partner Many hospitals provide an in-room convertible bed for birth partners. They may not be the comfiest, but they are convenient. Your partner will need a change of clothes as well as a pillow. Have him pack a sweatshirt too. If you plan to have a water birth or use a shower while in labor, your partner should have a suit. A nice surprise note and a favorite snack is a good idea too! Snacks Snacks are particularly important, especially if your labor becomes a long one. Many hospitals don’t have a 24-hour cafeteria, and no one wants vending machine stand-bys after spending eight hours in labor and delivering at 2 a.m. in the morning. Pack what you like to eat! Cash It’s a good idea to pack cash to cover any parking garage fees, vending machine runs, or a I’m-not-eating-stuff-from-a-vending-machine-I-just-delivered-a-baby run to a local burger joint or milkshake shop. A Nightgown Your old one may be destroyed; if it isn’t, it will certainly be sweaty—best to pack a change of sleeping clothes. Nursing Bras Whether or not you plan to breastfeed, your breasts will become quite sore as your milk comes in. Many women often find laboring in nursing bras quite comfortable as well. Show the girls some love by giving them support! Mama Underwear After you deliver the hospital should provide you with mesh underwear, heavy-duty sanitary pads, and ice-packs to counter the vaginal swelling. Although some women don’t mind the mesh underwear, others find it annoying. A Journal or App Most pediatricians recommend tracking your baby’s feedings, diapers, and sleep habits. You can do this in a designated notebook or in an App; there are tons of free ones out there. You may also want a pen and paper, or a simple note-taking app to write down questions that you have or to write down information that the nurse, lactation consultant, or pediatrician shares with you. Celebratory Toast Whether you toast with sparkling cider or chocolate truffles, pack something nice to celebrate the arrival of your little one! It can be difficult to manage one large, unwieldy hospital bag for delivery. Consider instead packing two smaller bags. You could pack his and her bags or pre-baby and post-baby bags. And just remember: women have been giving birth for centuries—it’s not the end of the world if you forget something. Have to wear hospital gown instead of your own? No biggie. The most important thing is that you’re about to meet your son or daughter. What is the best time to do a pregnancy test for the Most Accurate Results?